Cameco Corp.’s underground Rabbit Lake uranium mine in the Athabasca Basin about 700 km north of Saskatoon, Saskatchewan. Photo courtesy Cameco Corp.
Cameco Corp. [CCO-TSX, CCJ-NYSE] shares rallied Friday for the second day in a row as analysts revised their stock price targets following a favourable legal ruling by the Tax Court of Canada. Scotiabank’s base metals analyst, for one, has raised his one-year target price to $15 a share from $12 to reflect the removal of the significant Canada Revenue Agency overhang. Cameco shares responded by jumping to a high of $15.05 on Friday, up from $12.41 before the ruling was announced on September 27, 2018. The Tax Court of Canada ruled that Cameco’s marketing and trading structure involving foreign subsidiaries and the related transfer pricing methodology used for intercompany uranium transactions are in full compliance with Canadian laws, based on 2003, 2005 and 2006 tax returns. 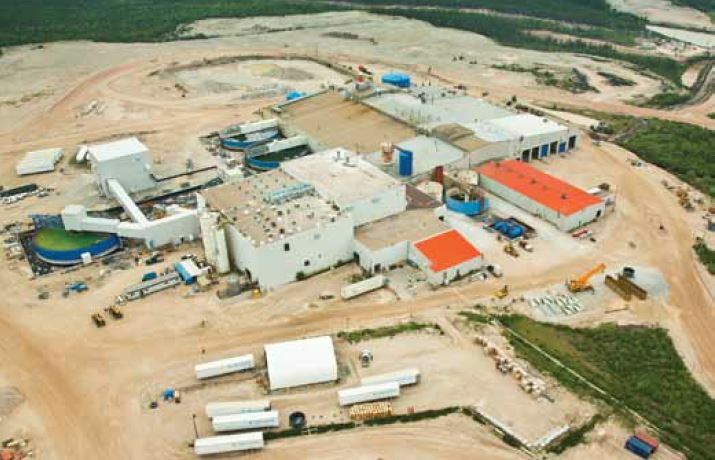 While the ruling is not legally binding for the other tax years in dispute, Cameco believes there is nothing in the decision that would warrant a different outcome for those years. “This is very positive,” Scotiabank said in a note to investors. “As at the end of 2017, Cameco estimated its potential Canada Revenue Agency liability at between $1.95-$2.15 billion, or $4.92-$5.43 per share, plus interest and installment penalties for all tax years in dispute (2003-2017). As of the second quarter of 2018, Cameco had pre-paid the Canada Revenue Agency $303 million or 77 cents a share in cash. The next steps are outlined below in the Scotiabank report. The Canada Revenue Agency has 30 days to appeal the court’s decision, which appears to be a potential possibility. If appealed, the appeals process is estimated to take approximately two years. Decisions of the Federal Court of Appeal may be appealed to the Supreme Court of Canada. If the Supreme Court decides to hear the appeal, Cameco estimates that this process could take another two years. Despite the positive ruling, the timing for the company to receive its refunds plus interest is currently uncertain. Cameco also plans to make an application to the court to recover legal costs, estimated at $60 million to date. Scotiabank says the tax ruling is also positive for Wheaton Precious Metals Corp. (WPM-TSX, WPM-NYSE), already the world’s leading silver streaming company, as the Canada Revenue Agency contends that income earned by Wheaton’s foreign subsidiaries from mines outside Canada should be taxable on the basis of transfer pricing. In addition, the tax ruling could also be good for Franco Nevada Mining Corp. [FNV-TSX, NYSE], Scotiabank said. The Canada Revenue Agency is currently auditing Franco-Nevada’s 2012 to 2015 tax years. While a Scotiabank analyst said Franco-Nevada is not aware of the specific focus of the audits, she said it would include transfer pricing related to an offshore subsidiary in Barbados, as the Canada Revenue Agency’s case against Wheaton Precious Metals uses a similar offshore structure. However, the Scotiabank analyst cautions that there are many differences between the facts of the Cameco case and Franco-Nevada’s transfer pricing arrangements. So while this news is incrementally positive, it does not necessarily imply that there will be a favourable outcome to Franco-Nevada’s audits. Franco-Nevada has calculated its potential back tax exposure to year-end 2017 at $25 million. It is estimated that if Canadian taxes were applied to the company’s offshore stream income going forward, it would reduce Franco’s net asset value by 5%. On Friday, Franco-Nevada shares eased 0.47% or 38 cents to $80.80. Wheaton Precious Metals was also off 0.67% or 15 cents to $22.60. Franco-Nevada is a leading gold royalty and streaming company with a large and diversified portfolio of assets. Franco-Nevada says it has no debt and uses its free cash flow to expand its portfolio and pay dividends.